We want more Pear deck! We want more Pear Deck! This is the consensus of my entire class after using Pear Deck in one of my lessons. After using Pear Deck just once my students are demanding we do more of them. My students love the way they can interact with a presentation using Pear Deck. And I love the way I know all of my students are engaged by answering questions on each slide of my presentation. Pear deck integrates with google drive meaning all of my presentations and students results are saved automatically it has now become a great activity in my Spanish classroom. 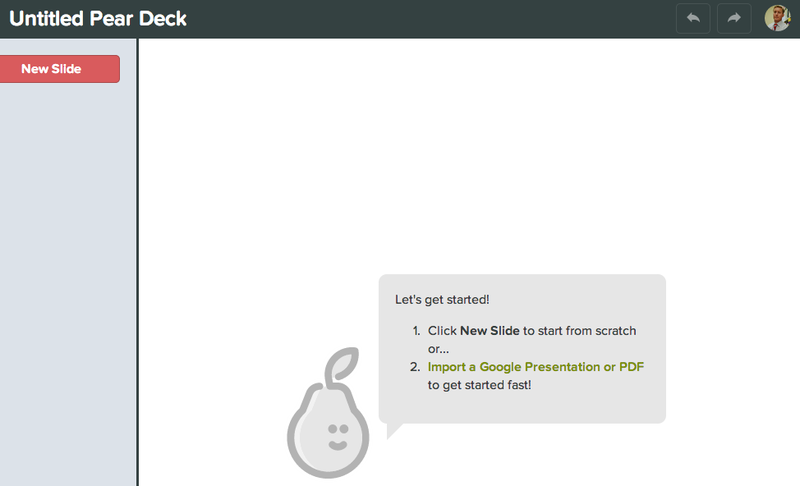 Creating a Pear Deck presentation is simple. You can either export an existing presentation or you can create one within the application of Pear Deck. 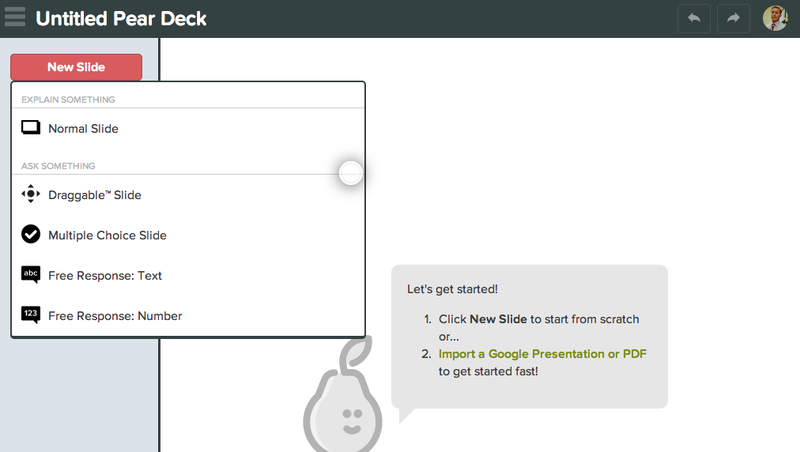 If you chose to create your slides within pear deck, you will see five different options. 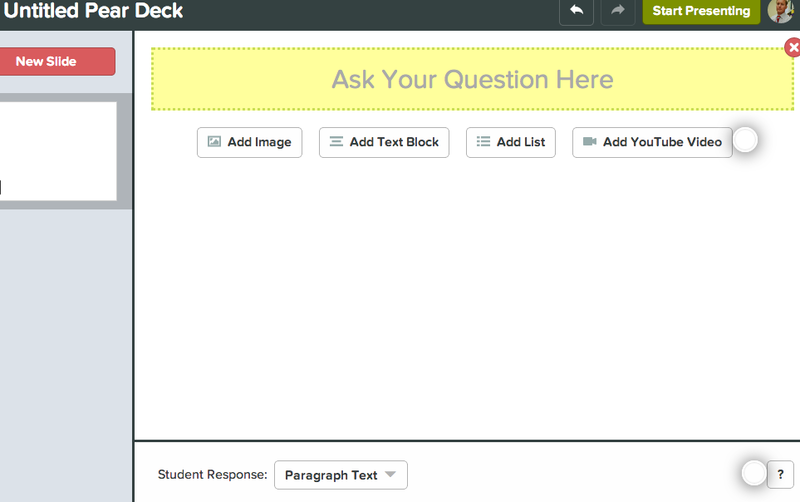 Pear Deck makes it extremely simple to assess students during a presentation, by inserting questions in each slide. For my classes I chose the to create "Free Response Text" slides. 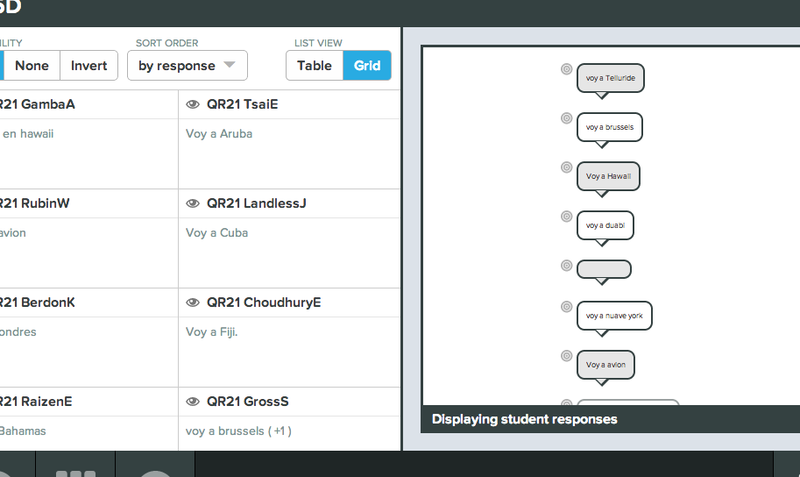 This is the perfect way for students to practice answering written questions in Spanish. I type my question at the top, then add in a picture to visually aid the students understanding of the question. The bottom will say "Student response:" Here you can chose to have the students answer with either a short response or a paragraph. For my presentation I chose to have my students answer with short answer text. My goal was to see if my students could correctly answer written questions. Pear Deck was very user friendly and within no time I had my first Pear Deck presentation ready to go. 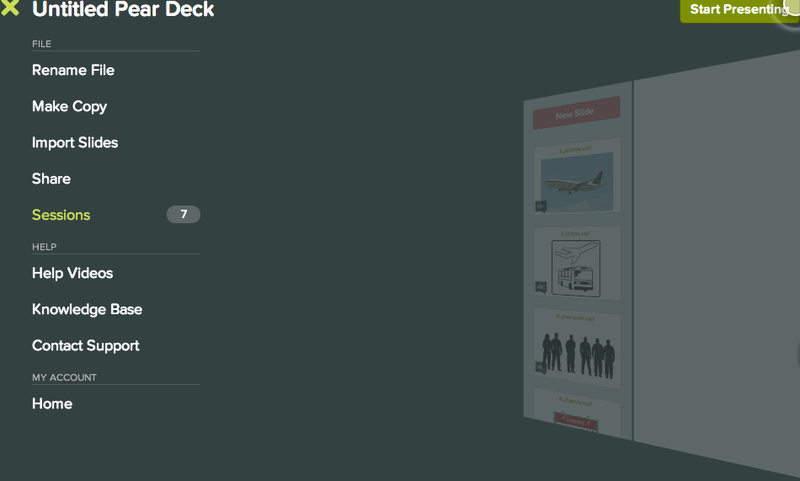 My first go ahead with Pear Deck was a complete success. Students were easily able to join the presentation on their Chromebooks. The students really enjoyed answering the questions on each slide. Pear Deck was a complete success for student participation. When the presentation is over you can chose to take a look at the results by clicking on "Sessions." From here you can see all of the results from the participants for each question. This proved to be a great way to see on each question which students were answering correctly. The results for each question will appear like this. Since this first Pear Deck lesson my students have been demanding more Pear Deck lessons! As a Spanish teacher it has served as a fun and interactive activity for my students, while I collect all the information I need to assess my students writing skills all at the same time. 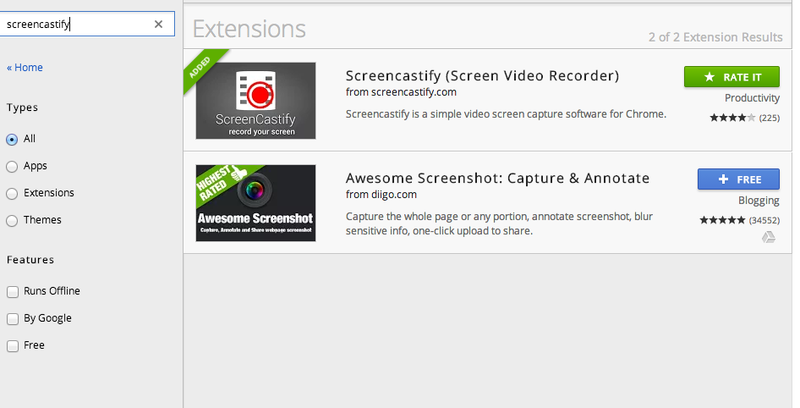 Screencastify para fazer Screencasts na sala de aula. Como um Professor de espanhol estou sempre procurando jeitos novos de gravar o áudio e vídeo com meus estudantes. Para um Professor de idiomas é muito importante evaluar a pronunciação dos estudantes ao momento que estão lendo. A aplicação de Screencastify com a extensão do Google Chrome faz possível gravar o áudio e vídeo fazendo uma atividade interactiva e muito divertida na sala de aula. Uma de minhas partes favoritas deste programa é a facilidade que pode guardar tudo no Google Drive. Este é uma das grandes vantagens que o faz superior a outros programas. Depois de gravar um Screencast um estudante pode compartilhar seu Screencast com o Professor ou qualquer outro pessoa. A aplicação coloca o poder nas manos dos estudantes a oportunidade de criar um trabalho que nunca vai perder e vai ter acesso com qualquer computador. Pode ver um exemplo de minha estudante.